A Hat In Time is coming to Nintendo Switch—with DLC and co-op! Fantastic news for Switch owners. A Hat in Time, an indie "Mario-like" 3D platformer (which, in my opinion, gives the plumber a run for his money) has been "on its way" to the Nintendo Switch for some time now. However, we've had no release date, and few updates from the team at Gears for Breakfast. But now there's something to be excited about. It's just been revealed that the Switch port is getting the local co-op mode (which was added to the PC version as a post-release update), as well as the Seal the Deal DLC! Although there's still no release date, I'm really pumped for this. Seal the Deal was a lot of fun and incredibly charming, but the real treat here is the co-op. In my previous post discussing A Hat in Time, I sang praises for how good the multiplayer mode is—a second player can hop in anytime, and is a fully playable character (unlike Cappy in Mario Odyssey). I wasn't sure if we'd see this on the Switch, however. It's a no-compromise split-screen local co-op, which can be demanding of system resources (something the Switch doesn't have a lot to spare). That being said, local multiplayer will be amazing for the Switch, and the Nintendo audience is going to adore playing this game with a friend. 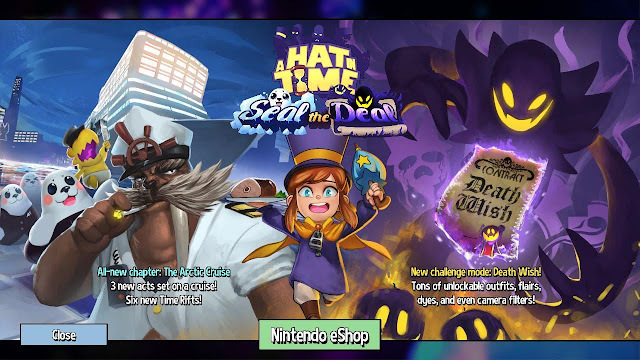 Are you going to pick up A Hat in Time when it comes out for the Switch? Have you played it before on a different platform? Let's discuss it in the comments below!